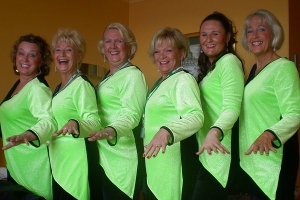 Wollongong Harmony Chorus is a dynamic, all female performing group. Established in 1990, their members range in age from 20 to 83 and come from all walks of life to share a great passion: singing. The group had its beginnings in March 1990, after a small group of 18 women were inspired by a performance of the visiting Sydney Town Chorus. This group of women has now grown in number to a vibrant chorus of over 60 members and growing by the week. Jan has sung in many different types of choirs since she was at primary school, but she says that nothing has ever challenged her and kept her interest as much as the barbershop style and the whole Sweet Adelines International organisation, which is the world’s largest women’s singing organisation. SAI puts a lot of emphasis on education and part of each weekly rehearsal is a vocal lesson where chorus members are taught correct vocal production and performance techniques. WHC loves to share their singing, with many public performances throughout the year, and they always welcome visitors and new members along to rehearsals. They are now offering a series of 4 free sessions to teach women about harmony singing and correct vocal production, starting on Wednesday 26th June at 7.30pm at the Farmborough Rd School Hall.